Remember all the way back in 2015 when we were in the midst of #guacamolegate, up in arms over the atrocity of green peas in guacamole? Even President Obama weighed in. Melissa Clark is the lady responsible for the shakeup. . . I fell in love with Melissa Clark before I ever cooked any of her recipes. I spent the summer on a long roadtrip, an entire season away from the kitchen and decent grocery store. I filled the culinary void by reading about food every chance I could. Melissa's In the Kitchen With a Good Appetite was one such escape, and was a revelation of a food memoir, the perfect story to recipe ratio and my favorite read of the summer. 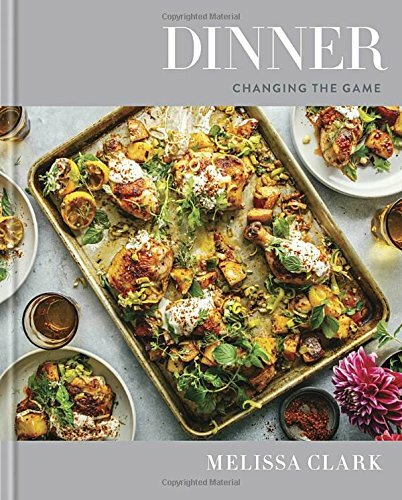 When Dinner popped up on my radar this fall I promptly added it to my wishlist and slowly watched the calendar move closer to launch date. Yes! I thought, but then, No! That cover, why? For such vibrant cooking, the cover falls incredibly flat, an overly muted wash of white and gray. But I forgive easily (see #guacamolegate above). Unlike In the Kitchen, the intro and headnotes in Dinner are brief, as well as the obligatory "stock your pantry" section. Here there are a pleasant few interesting pages here, I'm grateful for that, although I miss the engaging 3-page long headnotes that made me a fan of Melissa's in the first place. So what is this cookbook all about? Melissa makes it almost too easy: stock a small arsenal of really great, unique, international condiments and your dinner will be full of flavors you never imagined whipping up at home. You can't win dinner if you are stuck with a pile o' dishes at the end. Remember the esoteric condiments you stocked up on a couple paragraphs back? They are the basis for a multitude of amazing sauces. For me the Sticky Tamarind Chicken recipe fell short of my expectation, but the sauce on its own was perfectly assertive, so craveable I woke the next morning, rolled up a batch of quick meatballs (just ground pork, garlic, and salt), and coated them in a fresh batch of the Tamarind sauce. Pure perfection. My favorite ingredients show up time and again in her recipes: capers, anchovy, tamarind, tomatoes, burrata. Pretty much anything that leans toward the umami. Its almost as if she is my own personal recipe writer. Go buy this book, fill your grocery basket, then start cooking away . . . This book is about the recipes. Its about great flavors and getting dinner on the table, fast. It came through on its promise for me, so I'll certainly return for more. A quick (<10 minute) and satisfying dish thanks to preserved lemon. This was a quicker and better-than-advertised dish. I'm not sure what compelled me to make it, I typically avoid beans, but man it came together in all of 10 minutes. Both Kenny and I loved it, and I was eager for lunch leftovers the next day. Top it off with pickled red onion (missing from the photo). I had already made four recipes, when I listed to Melissa announce that this was "the dish to make" on the Eater Upsell podcast. Fine, Melissa, I'll try another. And thank goodness I did. This is The. One. The one that gets you to say "I do" to Dinner. Bright, fresh flavors, layered on a savory spiciness. Did I mention its easy to make? The perfect dish to prep in between episodes of your current binge-watch. A solid recipe to start my adventure changing the dinner game. Fish stock was once a foreign concept to me, but then I took Cooking Fundamentals at SF Cooking School, and now I butcher fish for fun. I popped a fish carcass in the Instant Pot, made a quick stock. This may be too ambitious for you, thats what grocery stores were invented for. Don't let laziness get between you and this tasty chowder. Greens = great, pork chop, nothing special. I wanted to love this, but it fell short for me. I like the flavor of the greens with kimchi, possibly worth trying those together on their own. Pork chops have found a hundred better pairs, so I'll likely look for something new next time. A winning sauce that needs more time to make an impact. Ditch the instructions and marinate the meat for some time—hours, days, I dunno. You could also skip all that, and use the sauce on something else like I did—pork meatballs. The sauce is addictive, worth making on its own.